In the Italian city of Milan, Expo 2015 was a six-month celebration of technology and culture built around the theme “Feeding the Planet, Energy for Life”, which showcased evolving innovations and attitudes relating to food, nutrition and health. Ironically, the event ended up producing enormous quantities of food waste. Every day, tons of excess food—mostly bread and vegetables—were discarded and would have gone to waste were it not for the intervention of one man. Massimo Bottura, head chef at three-Michelin-starred restaurant Osteria Francescana in Moderna, devised a unique project to redirect this food into the mouths of those most in need, in an imaginative and invigorating way that would leave a profound impact on all who experienced it. Theater of Life, a new documentary from Czech-born filmmaker Peter Svatek, chronicles Bottura’s creation of the Refettorio Ambrosiano, a soup kitchen in the bowels of an abandoned theatre in Milan’s dilapidated Greco district. Run in collaboration with church foundation Caritas Ambrosiana, Bottura and a team of 60 world-renowned chefs worked every day to create traditional, gourmet cuisine for the city’s homeless, using only leftover food from the Expo. Svatek follows culinary maestros including Rene Redzepi and Alain Ducasse as they embrace this unique challenge, while simultaneously following the trials and misfortunes of some of the refettorio’s regular patrons. The chefs, who hail from every corner of the globe, are clearly passionate about the project; but even so, their efforts are not uniformly embraced. Even the hungriest patrons can be sheepish to try some of the more adventurous dishes. These hardened veterans of rough living know what they like and can be defiantly set in their ways. It is to Svatek’s credit that the film never shies away from exposing the rougher edges of these characters or their stories. It would have been easy, perhaps even tempting, to portray the soup kitchen patrons as uniformly grateful and gracious, but the truth is they are fully rounded individuals from wildly different backgrounds who have often been put through life’s wringer. They don’t suffer fools gladly—even when they come bearing the gift of a hot supper. Stefi and Marco are well into middle age and have been living rough for years at the city’s Monza train station. Despite being confined to a wheelchair, Marco stubbornly refuses to move into a shelter, instead holding out until the couple can find their own home. Christina is an African single mother working as a prostitute, while her friend Fatou hopes one day to become a model, despite also being unable to use her legs. Fawaz was born in the Middle East and remains somewhat cynical about the soup kitchen, seeing it as a short-term solution designed more for Bottura’s benefit than his own. It is fascinating to witness this shift in dynamic between chef and patron. These culinary celebrities are in town because of their global renown, and are used to their customers also being fans—diners who have waited months or even years to experience their cooking, not to mention having paid through the nose for the privilege. At Refettorio Ambrosiano, not only are most of the clientele unaware of who is cooking their meal for them, they are not particularly interested. Some even complain about the sophistication of the dishes, and on more than one occasion the chefs admit that they found it a struggle to make conversation with their guests. 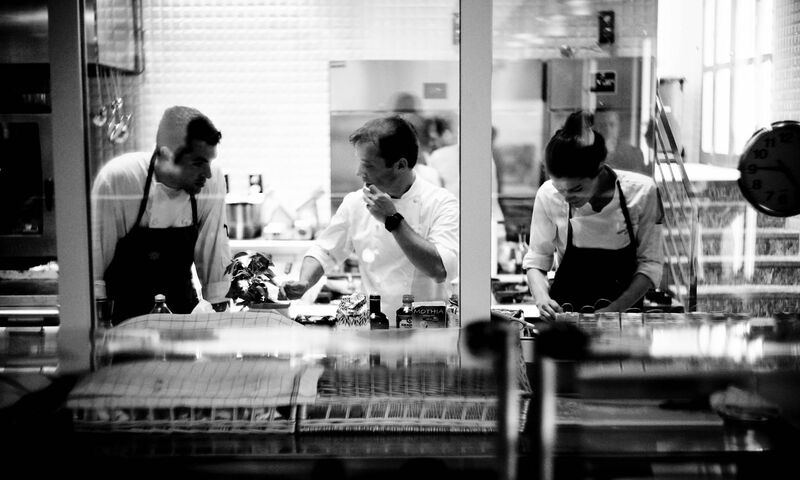 Bottura is determined to continue the fight against food waste through social inclusion. Together with his partner Lara Gilmore, he formed the non-profit Food for Soul (foodforsoul.it), and launched a second Refettorio soup kitchen in Rio de Janeiro during the 2016 Olympics. Both projects continue to run to this day, together with new locations in London and Paris. While Theater of Life might lack the journalistic teeth to confront the Expo organisers directly about the amount of food waste they generate, what Svatek does achieve, quite beautifully, is a balanced portrait of both sides of Bottura’s project. He holds back from idolising the chef’s mission, or indeed fawning over the celebrities who are so often regaled for their artistic prowess in the kitchen. Similarly, he doesn’t condescend to his participants within the homeless community. They need help, but not at the expense of their dignity. Theater of Life serves up both. Originally from England, James Marsh has lived in Hong Kong since 2001. He is a film critic for the South China Morning Post, RTHK Radio 3 and Asian Editor of ScreenAnarchy.com. He is a festival programmer for Fantastic Fest and an acquisitions executive for XYZ Films. This article originally appeared on T.Dining by Hong Kong Tatler. Theatre of Life is available on Netflix.